The task of surveying and documenting the ecological nature of a property may sound quite challenging, particularly when you have 358 ac. to cover. 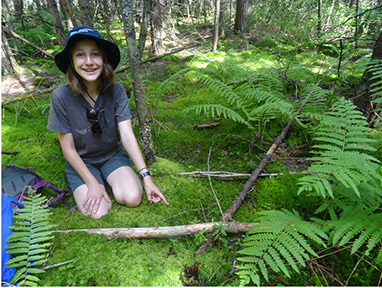 Consulting ecologist, Holly Bickerton, and MMLT’s Ecological Stewardship Committee Chair, Cathy Keddy, took the plunge this summer and conducted field work to enhance our knowledge of the nature reserve as background for preparing a Baseline Documentation Report. A BDR is a status assessment that can be used as a baseline against which future property conditions can be compared, the effectiveness of stewardship activities judged, and the direction of future stewardship activities planned. 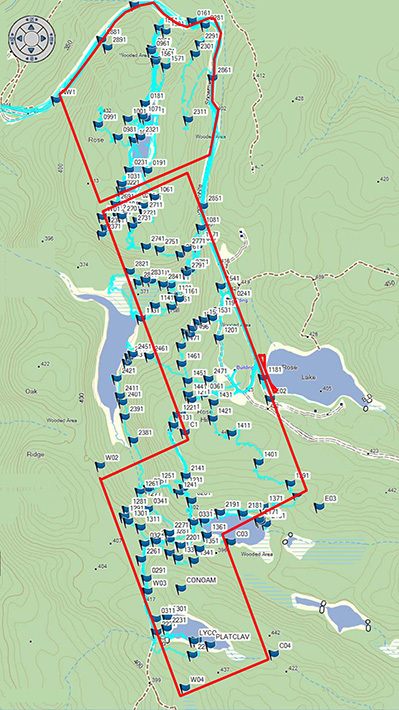 So, while this was the technical reason for spending time in the field this spring, summer, and fall, it was the lure of discovery that took the field team from one end of the reserve to the other (2.8 km), from the highest to the lowest elevations (55 m/179 ft.) and from the driest rock barrens to the wettest depressions. What did the team discover? Their investigation revealed fantastic fungi, outstanding orchids, phenomenal plants, lovely liverworts and more. Read on for the highlights. 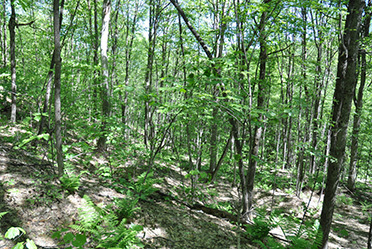 Rose Hill Nature Reserve (RHNR) is blanketed by a diverse suite of 22 ecological communities ranging from high rock barrens to low marshes and ponds, but most of it is covered by upland deciduous (sugar maple, sugar maple-oak-hickory) and coniferous (hemlock, white spruce, white pine, balsam fir) forest. 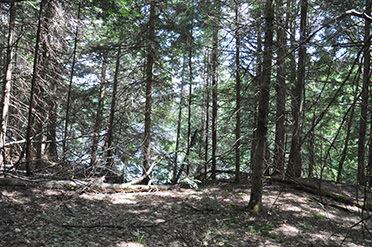 Particularly noteworthy are two groves of red spruce (Picea rubens). Yes, it does not even occur in Lanark County and is described as rare and local in Renfrew County. 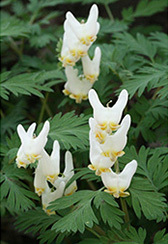 It is a species from the Maritimes and considered vulnerable (S3) in Ontario because of its restricted distribution. 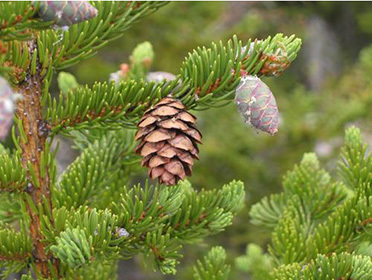 The twigs are coated in red hairs and the cones are intermediate in size between black and white spruce. 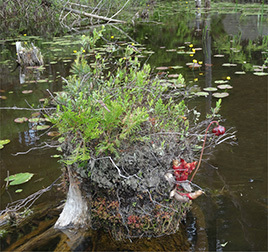 Interesting wetlands are also associated with Fufflemucker Pond, found at the north end of the reserve and created with the assistance of beavers. This approximately 6 ac. 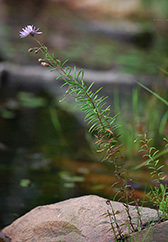 pond is perched in the saddleback of a double-peaked hill (420, 430m peak elevations) of Canadian Shield that rises 40 to 110 m above the surrounding terrain. The pond is ringed by an ecological community known as “poor fen” (poor in the sense of number of plant species) which is intermediate in nature between two peat-dominated wetlands—bogs (species poor, low pH) and fens (species rich, high pH). Naturally it has some species that are typical of fens, such as Buckbean, and some common in bogs (e.g., Pitcher Plants, Sundews). 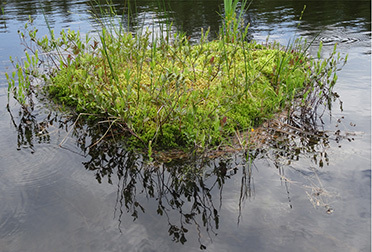 Poor fen species also occur on peat islands near the shoreline on the west side, and beautiful mini-gardens of these species hug the old beaver stumps. Look at the peat island closely. What do you make of the wee orange knob apparently attached to the right side of the island—animal, vegetable, or mineral? 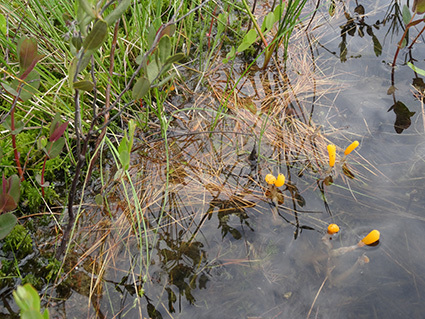 My need to know got the better of me and I waded out in thigh-depth water, dodging a deep hole in the peat substrate (where I would almost have disappeared), to discover that this was an aquatic fungus, appropriately called Swamp Beacon and very unusual. 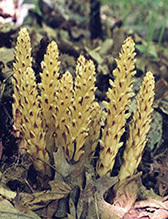 It grows on decaying conifer needles, produced by the adjacent white pine and spruce forest. A total of 389 vascular (not mosses/liverworts) plant species was found on the reserve, of which 338 (87%) are native. 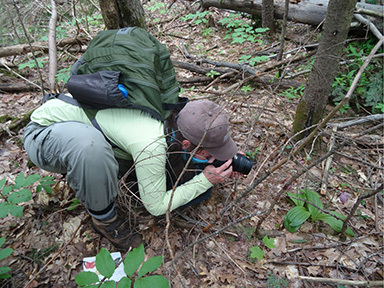 While the Plants of Lanark County, Ontario by David White and a similar document for Renfrew County prepared by Daryl Coulson are valuable tools for assessing the flora of these counties, RHNR occurs in neither but very close to both. 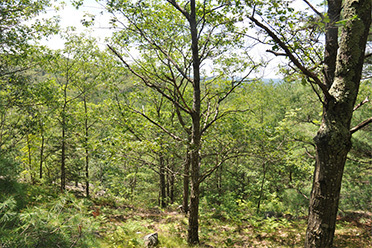 Rose Hill Nature Reserve is between these two jurisdictions, up in the highlands at the north end of Lennox and Addington County. So we decided that any species found at RHNR that was considered of interest in either of these two neighbouring counties would be counted as being of regional interest. Building on previous fieldwork done by Eleanor Thomson on the Armstrong/Bernhardt portion of the reserve and our 2017 fieldwork, we were able to compile a list of 165 vascular plant species found on the reserve that can be considered regionally uncommon, sparse, or rare. 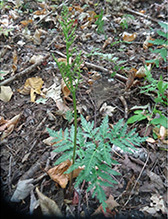 Significantly, 27 rare species made the list including Bog Aster, Cut-leaved Grape Fern, Dutchman’s Breeches, and Squawroot which are featured below (Red Spruce and Spatulate-leaved Sundew are above). Speaking of baselines and historical records… Patricia Hatton took the photograph below in 1979. That was 38 years before our study! 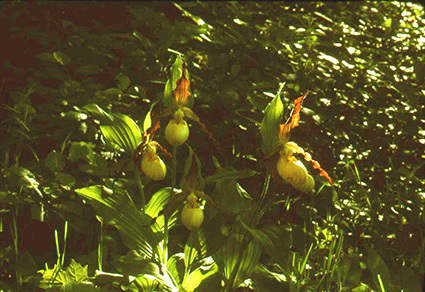 No Yellow Lady’s Slippers were found this past summer. Is the habitat no longer suitable? Did a deer scarf them down? They are something to look for again this coming summer. Of the total of 90 mosses and liverworts (bryophytes) at RHNR, 30 species are first records for the county, but none is a Species at Risk. The bird list sits at 56 species, with 17 being area-sensitive—demonstrating the large, intact nature of the reserve for avifauna. Eleven amphibian species are now known from RHNR and the Great Lakes-St. Lawrence population of one of them is threatened—a chorus frog. Listen to it here. Yes, this is right! It is the sound of the Boreal Chorus Frog. 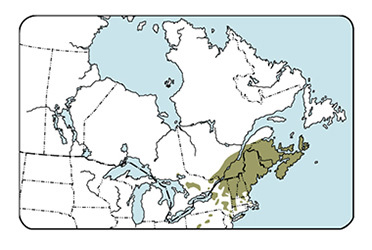 Ten years ago, analysis of mitochondrial DNA in chorus frogs of North America showed that what we were calling Western Chorus Frogs in eastern Ontario were not likely this species, but Boreal Chorus Frogs. 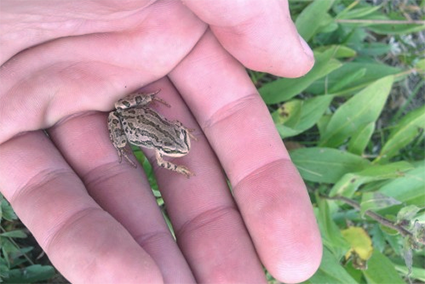 In Ontario, the study said, Western Chorus Frogs occur only in the southwest. The jury is still out, however. Some say nuclear DNA testing is required to be sure of the frog species’ identities. So, while it appears we will have to wait for more evidence before we can say whether our chorus frogs are western or boreal, whatever it is, the regional population is threatened. Other Species at Risk found at RHNR include the Monarch Butterfly, Eastern Wood-pewee and Bald Eagle. 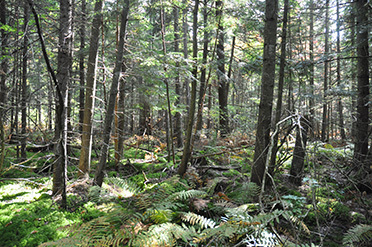 There is suitable habitat for several other SAR, which may be found with further study. Can you identify the Pewee and Monarch? MMLT’s challenge will be to steward RHNR to maintain its non-human inhabitants and its apparent untamed wildness while minimizing the impacts of our desire to appreciate them at close range.